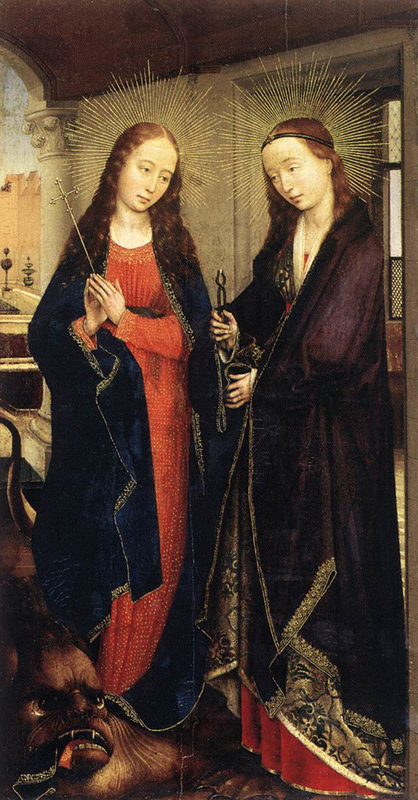 You wouldn't know it by looking at this serene painting, but Saints Apollonia and Margaret both suffered through some horrible and bizarre experiences to get their titles. Saint Apollonia was a Christian who had the misfortune of living in Alexandria, Egypt at a time when being Christian was not cool. Like many saints, she met her end in an extremely gruesome way After a crazed mob tortured her by breaking all of her teeth (thereby transforming her into the patron saint of dentistry), they lit a large fire and threatened to burn her alive unless she renounced Christianity. Apollonia said something like, "Fine, I'll do it, but let go of me first." But when they let her go she leapt into the fire, burning to death without having renounced her faith. Oldest trick in the book. This act has been slightly controversial, even to this day, because the church is, normally, not down with suicide. They looked the other way on this one and sainted her anyways, so we get to see her in paintings. There are about three or four saints named Margaret, but this one lived in Turkey and got swallowed by a dragon. A dragon who was really Satan, of course, trying to convince her to not only renounce Christianity, but also to give up her virginity! Fortunately, she was carrying a crucifix. The crucifix irritated the dragon's stomach lining, so the dragon spat her back out and she lived happily ever after. In a seemingly illogical twist, Margaret became the patron saint of pregnancy. Then again, not much else about that story makes sense either.